Experience HD picture quality, incredible contrast and sharp, vibrant, life-like picture with the Sony BRAVIA® BX300 Series HDTV. This compact HDTV is perfect for smaller size rooms, such as a dorm or kitchen and offers ample HD connections. Connect your BRAVIA Sync™ compatible devices and enjoy convenient operation and control using one remote. Enjoy crisp, detailed and vibrant images in 720p picture quality while watching movies, sports and primetime HD television broadcasts via the 16:9 wide screen panel (1366 x 768). The KDL-32BX300 takes Sony to an interesting new place: a price point of under $500 for a 32-inch HDTV. That makes this new model one of the cheaper 32-inch HDTVs out there. What your $500 gets you is a basic, but decent looking display. This display will be available in March. If you’re considering a smaller TV we believe there’s little reason to get one with an LED backlight or 1080p resolution. Sony’s KDL-BX300 series is the company’s least expensive for 2010, and it offers neither feature. It also lacks the USB port of the Samsung LN32C350 we compared it with, but otherwise their feature sets and picture quality are nearly a match–although we believe the Sony has a slight edge in the latter category. We can’t tell you whether the BX300 is substantially better than even cheaper off-brand sets, but if you’re looking for a solid name-brand bedroom TV, the BX300 qualifies. 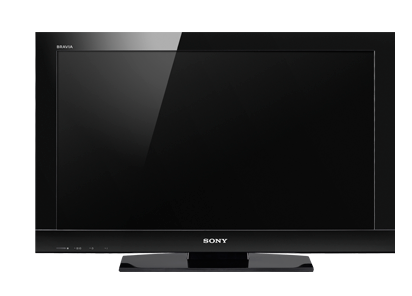 The Sony KDL-32BX300 ($429 MSRP) is a budget, 32-inch LCD television. How can you tell it’s budget? Well, first there’s the price, which is cheap for a Sony HDTV. Secondly, the resolution is limited to 720p, as opposed to the higher 1080p you’ll find on most 2010 TVs. At this screen size, you may not notice a whole lot of difference, and we were pleased to find that the KDL-32BX300 faired decently in our tests.